For vehicles, SM City Marikina can be reached via Marcos Highway exiting the exclusive ramp built for SM City or via the service road to the immediate right which leads to parking. What many may not know though is that SM City can also be reached by foot via the access path following Marikina River's curvature. 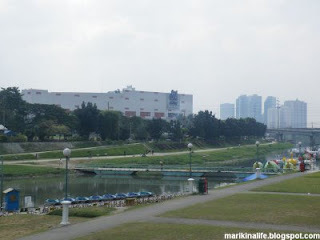 Just across SM City Marikina, separated by Marikina River, is Marikina Riverbanks. A floating foot bridge is provided for easy crossing from one side to the other. 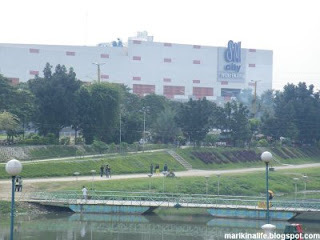 In addition, SM City Marikina happens to be on the side of the Marikina River where a long cemented trail is suitable for walking and biking. 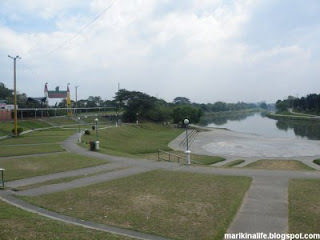 You can be from as far as Lamuan and Bayan passing through San Roque and Calumpang and traverse the trail while enjoying the serene waters of the Marikina River as it curves and eventually leads to SM City Marikina. From the path, you can cross the street to the ground parking lot and take the stairs leading to the mall itself. So you can avoid parking or commuting fees while taking a leisurely route and exercise in the process before you go malling.